If making pie crust makes you crumble, try this one! 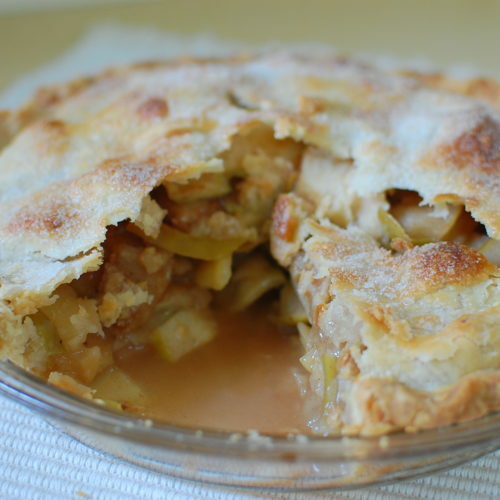 It’s perfect for sweet or savory pies and is my favorite for apple pie. I use it for Rita’s Pumpkin Pie too, which is the only way I make my Thanksgiving pumpkin pies. Now to the pie crust. I rarely see a pie crust made with oil. Butter, lard, shortening, or a combination of those fats are usually cut into flour then carefully blended and chilled, which isn’t difficult but keeping the mixture cold and not over-mixing is important. A simpler recipe I learned from my mom when I was a youngster is Stir-N-Roll Pie Crust from the Betty Crocker Picture Cookbook. Vegetable oil is the fat, so if you like to avoid saturated fat, this is the crust for you. It’s light and flaky, plus it’s half the amount of fat compared to a typical pie crust. And it’s EASY, the way we like it at GetCookingSimply! Just don’t make the dough ahead and refrigerate. My friend Brooke who writes a food blog from London did that to get ahead on her Thanksgiving baking last year. The dough gets too firm and is un-rollable. I was lucky she didn’t phone me in frustration at 2 am pacific time! Appealing ideas that may be new to you – hey, we all get in cooking ruts! Approachable techniques for every day cooking. Accurate recipes for home kitchens and home cooks, who don’t have prep cooks! Achievable results for recipes you want to make. Let us know if they work or don’t work for you! Rita and I wish you a Happy Thanksgiving whatever way you roll your pies! We’d love to hear about your favorite pies in the comments section below. Stir dry ingredients together in a medium bowl. Measure oil and milk together in a glass measuring cup. Add all at once to the flour; stir lightly and quickly with a fork, just until flour is completely moistened. Shape into a ball with your hands. Cut in half with a knife. Lightly dampen a smooth work surface so that a square sheet of wax paper will stick. (Wax paper works best) Place one half of dough on paper, place second sheet of paper on top and flatten dough with hand. Roll from center of dough towards edges until dough is an even thickness (about 1/8 inch) and about 1 inch wider than diameter of the pie dish. Remove top sheet of wax paper. Lift by holding bottom sheet and invert over dish. Gently lift and set dough firmly against dish, smoothing any air bubbles. Save scraps that might tear from edges for patching later. 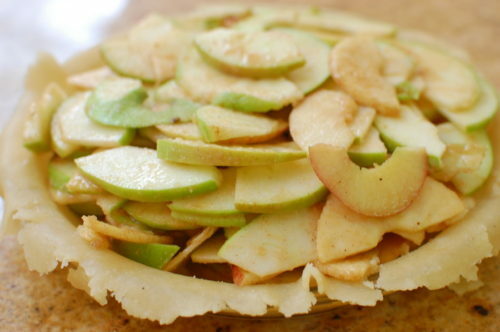 Combine filling ingredients and place in dish, arranging apples so they are slightly compacted. Roll second crust and invert over filling. Pinch and roll top and bottom edges together, tucking firmly onto rim of dish. If dough cracks, mend by pressing together or adding a scrap of dough. Bake at 400°F about 1 hour until golden brown and juices are bubbly. I suggest placing a sheet of aluminum foil on the rack below the pie to catch any juices. Cool slightly before serving or serve at room temperature. Best enjoyed the same day, or reheat second day before serving. Tips: Wax paper is key to rolling the dough. I've tried plastic wrap and parchment, neither work well. If you prefer less liquidy pie juices, sprinkle the bottom crust with a scant tablespoon instant tapioca before adding the apples. 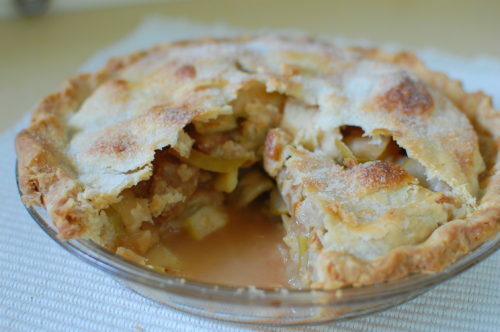 This post in Simply Recipes has great tips on baking apple pie and many other delectable pies.